A Manchester Township man lost control of his vehicle while trying to make a left-hand turn from the Santander Bank on Route 70 near the intersection of Route 571 and struck numerous business signs before crashing head-on into a steel Quik Chek convenience store sign. The operator and lone occupant of the vehicle, 86-year-old, Harold Barnett, was transported to Community Medical Center in Toms River for treatment of a chest injury. On Tuesday, January 24th, at approximately 1:12 p.m., officers from the Manchester Township Police Department responded to the area of Routes 70 and 571 in the Ridgeway section of the Township for the report of a one car crash. Initial reports indicated that the involved vehicle left the roadway and collided head-on with a steel Quik Chek sign. 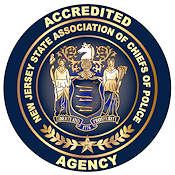 Upon arrival, officers located the involved vehicle, a beige, 2006, Honda Civic off the roadway on the north side of Route 70 against the steel support post for the Quik Chek sign. The driver, Harold Barnett, was still inside of the car and had to be helped from the vehicle by emergency workers. 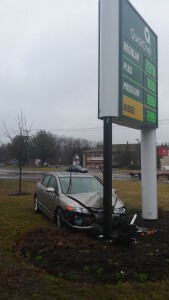 The initial investigation revealed that Mr. Barnett was attempting to turn left from the Santander Bank on Route 70 westbound, when he accelerated across the roadway, struck a curb and multiple business signs before colliding head-on into the Quik Chek sign. The vehicle had significant front end damage as well as airbag deployment. Barnett, who was wearing his seatbelt at the time of the collision, was transported to Community Medical Center for the complaint of pain to his chest. His current condition is unknown. Assisting at the scene were EMT’s from Quality Medical Transport. The accident is currently under investigation by Patrolman Ian Bole of the Manchester Township Police Department Traffic Safety Unit.